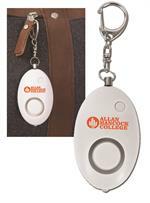 Safety Alarm Key Chain has an alarm that is 100 - 110 decibels and can be heard up to 175-225 feet, depending on surrounding conditions. Prices range from $3.99 to $2.88 each. Our Stock "HOPE, COURAGE, ENDURANCE, BRAVERY" Awareness bracelets make terrific fundraisers and give-aways for all of your awareness events. 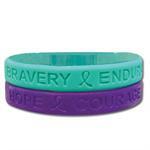 These bracelets are available in Purple or Teal. Prices range from $1.49 to .49 each. 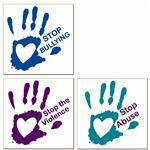 Stock Pencil: "Stop the Violence" and "Love Shouldn't Hurt"
Our Metallic Awareness Ribbon Stock Pencils are available in Purple with the saying "Love Shouldn't Hurt" or Teal with "Stop the Violence". Prices range from .89 to .39 each depending on quantity ordered. 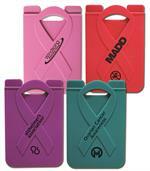 Awareness Ribbons are made of a durable jeweler's metal and have a rich enamel finish and a military clutch pin. Prices range from $1.85 to $0.70 each. 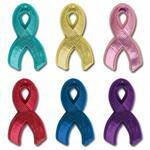 Satin Awareness Ribbons with safety pins. Available with custom imprint or blank. Prices range from .59 to .26 each. 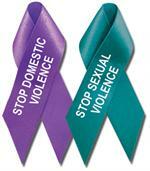 Satin Awareness Ribbons with tape. Available with custom imprint or blank. Prices range from .55 to .23 each. 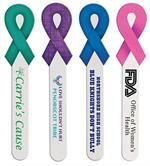 Our In-Stock Embroidered Applique Awareness Ribbons have stick-on adhesive backing and are available in our 7 most popular colors for fast shipping. Prices range from .69 to .21 depending on qty ordered. 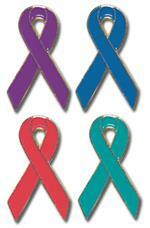 Our In-Stock Embroidered Purple and Teal Two-Tone Applique Awareness Ribbons have stick-on adhesive backing. Prices range from .65 to .24 depending on qty ordered.